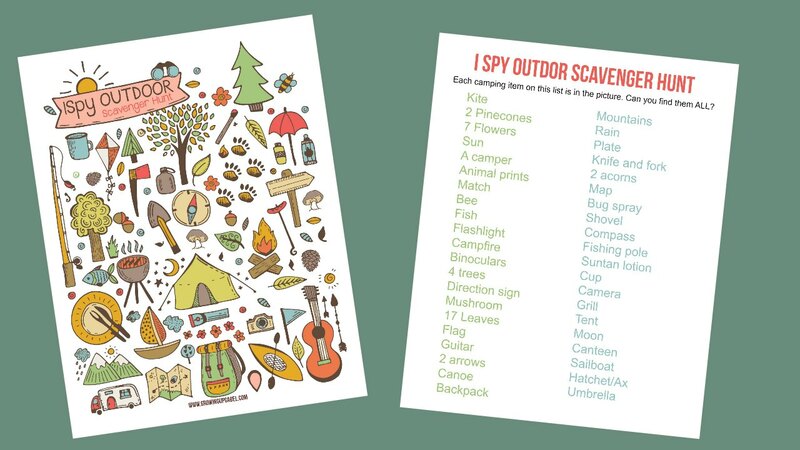 Play a fun version of an “I Spy” game with this printable camping game! 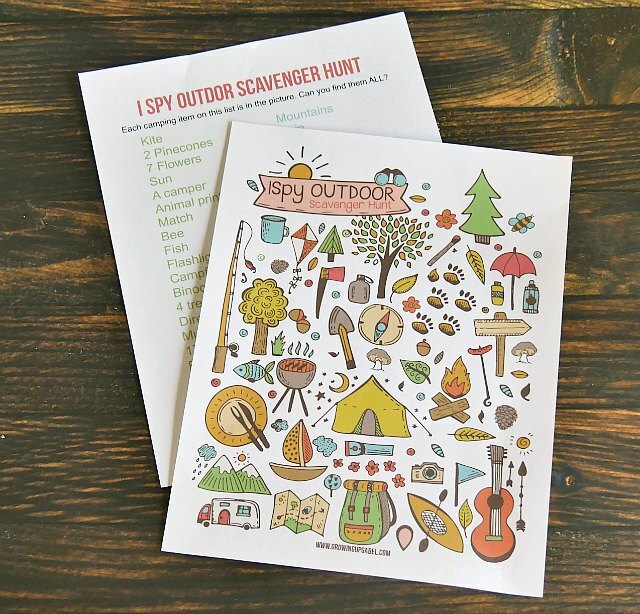 Perfect for rainy days or long road trips, this I Spy game will includes everything you need for camping fun. Every summer for the past three years we have taken our family to camp at a National Park. We started with sleeping tee pees at Bryce Canyon in Utah. The next year we ventured further away to Yosemite in California. This summer we're heading even further away to Yellowstone in Wyoming. Bryce Canyon is about 4 hours from our home and Yosemite is about 7 hours. Our trip to Yellowstone is about 10 hours. We spend a lot of time on the road. We have a bunch of road trip board games we all love to play. But this year I am putting together a travel binder for each kid with games, maps and information about the states we will be driving through. We'll be going through at least 4 but more likely 6 different states on this trip. There are a lot of really fun road trip printables available on the internet. I came across a super cute I Spy game printable, but it was beach themed. Since we're not going to a beach, I skipped that one. I loved the idea of it, but I really wanted it to be themed more for our camping adventures. So I made one! This is two page printable. One side is the “I Spy” photo with all the camping gear on it. The other is a list of what is in the picture. The goal is to find the entire list! Including all 17 leaves! It should be enough to keep the kids busy for a while. You can usually set up your printer to print double sided, but it may be easier for the kids to set the list out beside the I Spy puzzle. Thanks you for your printable Spy Game, it is very fan in a long road trips. My kids used to love playing I Spy on long car rides! This printable is so cute. Congrats on being featured in the #ThisIsHowWeRoll link party on Organized 31! I’m pinning this now! This looks so fun. We go camping all the time during the summer. I think my kids would really enjoy this game. Thanks for linking up to The Creative Exchange. We will be featuring your project this week. How FUN is this! I love camping and what a great way to get little ones involved and excited. 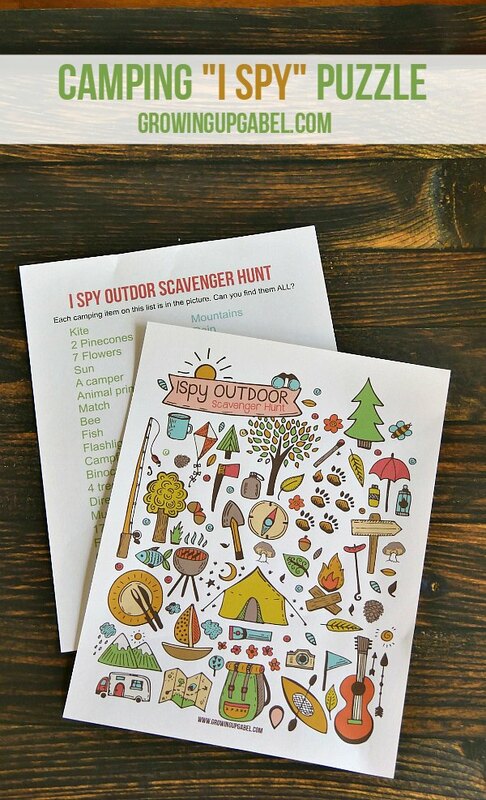 This Scavenger Hunt looks like a lot of fun! If we go camping, I’m definitely taking it with us! Thanks for sharing at Share The Wealth Sunday! How fun! My 6yo will love this. Pinned so I can print it for our next adventure. Thanks!